South African Airways (SAA) is looking to expand its partnership with Emirates or Etihad and add a stop in Dubai or Abu Dhabi on its Mumbai and Beijing services. SAA faces a challenging future but its outlook could brighten significantly if it is able to persuade Emirates or Etihad, with both of which it has (relatively limited) codeshares, to agree to a comprehensive tie-up. Improving the viability of at least two Asian routes through stopovers in the Middle East is among several initiatives aimed at improving the profitability of SAA’s long-haul network. 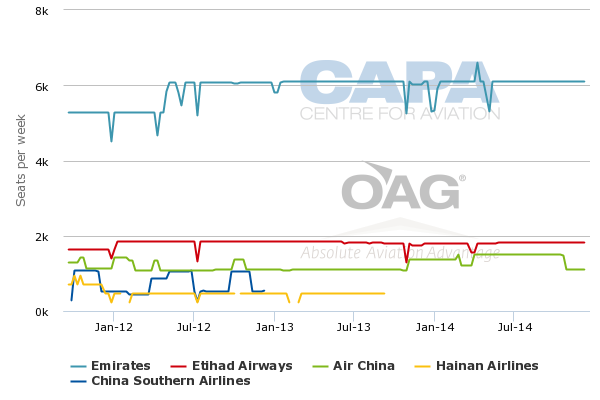 All three of SAA’s Asian routes and all 10 of its long-haul routes are currently unprofitable with Beijing seeing the largest losses per flight. SAA recently rescheduled its Beijing flights and added a fourth weekly frequency but believes other changes are needed to turn around the route. Johannesburg-Hong Kong could also potentially benefit from a stopover but for now will be maintained non-stop while SAA ponders stops for the Beijing and Mumbai routes. Fixing the long-haul network is the key focus of SAA’s new business plan as the carrier’s domestic and regional international networks are currently profitable. SAA has been slowly implementing some components of the new business plan since it was completed in early 2013. For example Buenos Aires, which was incurring losses of ZAR80 million to ZAR86 million (USD7 million to USD8 million) per annum, was finally cut at the end of Mar-2014. But other components of the new business plan remain unimplemented, including widebody fleet renewal. New generation aircraft are critical for all 10 of SAA’s remaining long-haul routes to have a chance at becoming profitable. SAA currently serves one destination in South America (Sao Paulo), two in the US (New York and Washington DC), one in Australia (Perth), three in Europe (London, Frankfurt and Munich) and three in Asia (Beijing, Mumbai and Hong Kong). It does not have any services to the Middle East. This is the first in a series of reports on SAA’s new business plan and outlook. This report will look specifically at the carrier’s three Asian routes and the prospects of improving SAA’s position in the South African-Asia market through a partnership with a Gulf carrier. SAA has worked with Emirates for several years but currently the two only codeshare on Emirates’ flights to Dubai from its three South African gateways of Johannesburg, Cape Town and Durban. A partnership with Etihad was forged in 2013 initially covering Etihad-operated flights from Johannesburg to Abu Dhabi and beyond to three destinations in the Middle East and four destinations in Asia as well as SAA-operated domestic connections beyond Johannesburg. While forged about a year ago, SAA says its codeshare with Etihad has only been in place about six months and it is too early to make a judgement on whether it has been successful. Etihad and Qatar are much smaller with Qatar only accounting for about a 2% share of total international seat capacity in South Africa and Etihad accounting for only slightly more than 1%. Emirates operates six daily flights to South Africa while Qatar operates 10 weekly frequencies and Etihad nine weekly frequencies, based on OAG schedule data for Aug-2014. As bigger airlines than SAA have learned, forging a strong partnership with a Gulf carrier is a better solution than trying to compete. SAA could potentially use Emirates or Etihad to access Eastern Europe but the primary focus would be to boost coverage in the Middle East and Asia. SAA enjoys a strong partnership with Star partner Lufthansa, which provides offline access throughout Europe via Frankfurt and Munich. A partnership with a Gulf carrier could boost coverage in Eastern Europe including the CIS region but SAA will lean towards keeping Lufthansa as its main European partner. In Asia SAA’s codeshare partners include Air China, Air India, All Nippon Airways, Asiana Airlines, Jet Airways, Singapore Airlines (SIA) and Thai Airways. But these are generally limited partnerships with only SIA and Thai serving South Africa. While South Africa-Asia connections via Asia can be relatively circuitous, the Gulf carriers are already carrying a large portion of passengers in this market as there are a limited number of non-stop options. Only five Asian cities have non-stop services to South Africa (Bangkok, Beijing, Hong Kong, Mumbai and Singapore). The Gulf carriers often offer cheaper one-stop options to these destinations and are generally well placed to serve the rest of Asia – competing primarily with Cathay, SIA and Thai – as SAA has relatively limited offline access in Asia. A strong partnership with a Gulf carrier could significantly improve SAA’s position in offline Asian markets. SAA also believes a tie-up with a Gulf carrier would improve its profitability in at least two of its online Asian markets, Beijing and Mumbai. Hong Kong presents a different scenario as Cathay Pacific also operates non-stop flights from Johannesburg to Hong Kong while SAA is the only carrier with non-stops to Beijing and Mumbai. A codeshare with Emirates and Etihad along with a stopover in Dubai or Abu Dhabi would significantly change the economics of the Johannesburg-Beijing and Johannesburg-Mumbai routes. While a stopover and a more circuitous routing via the UAE could be inconvenient to passengers, SAA would be able to boost load factors and yields by also picking up local passengers. SAA would risk losing some traffic in these markets to competitors but as there is no non-stop competition this would likely be manageable. Beijing has particularly proven to be an unviable route since it was launched as a thrice weekly service in Jan-2012. SAA says the route has been losing over ZAR300 million (USD28 million) per year. As the South African government was not willing to accept cutting the route because the link to China is seen as economically and politically critical, SAA has begun implementing initiatives aimed at reducing the losses. At the beginning of May-2014 SAA retimed its Johannesburg-Beijing flights to arrive in the late afternoon (about 17:00) rather than in the evening. The carrier also added a fourth weekly frequency. SAA’s ability to secure peak hour landing slots at Beijing, which is a major accomplishment for any carrier, allows for a wider range of domestic connections. SAA is now also discussing an expanded codeshare partnership with Air China. The two airlines have been codesharing on Johannesburg-Beijing and Beijing-Shanghai since one month after SAA entered the mainland China market. SAA is interested in adding more domestic routes to the codeshare, particularly as its new earlier arrival time at Beijing enables more connections. SAA CEO Monwabisi Kalawe is optimistic a combination of a stronger partnership with Air China, the retiming of the flights and the introduction of the fourth frequency will reduce the losses on Johannesburg-Beijing. But he believes the route can only break even with new-generation aircraft and if it is supported by a partner carrier from the Middle East. New generation widebodies are a longer-term solution which is critical to SAA’s overall turnaround plan. SAA currently has a widebody fleet consisting of A330-200s, A340-200s, A340-300s and A340-600s. Mr Kalawe says SAA recently tried to minimise losses on the Beijing route by switching from the A340-600 to the smaller A340-300 but had to revert back to the A340-600 following operational feedback from its pilots. A stopover in the UAE would give the carrier increased flexibility potentially to use other aircraft types in its existing fleet as SAA awaits for new generation aircraft. SAA is now aiming to acquire new generation widebody aircraft by the end of 2014 but it will have to wait at least a few years for delivery. Operating A340s and eventually new generation widebody aircraft via Abu Dhabi or Dubai is a sensible alternative for the Johannesburg-Beijing route. Beijing is an important market for both Emirates and Etihad. But the prospects of codesharing with SAA on Abu Dhabi-Beijing could be particularly appealing for Etihad as the carrier currently only operates one daily flight to Beijing. Emirates currently operates two daily flights to Beijing, including one with the A380, while Air China also operates five weekly frequencies between Beijing and Dubai. Mumbai is an even bigger market from the UAE. Currently there are about 62,000 weekly seats between Mumbai and the UAE. Abu Dhabi-Mumbai is currently served twice daily by Etihad, twice daily by its partner Jet Airways and once daily by Air India. Dubai-Mumbai is served five times daily by Emirates, four times per day by Jet Airways, twice a day by IndiGo and once daily by Air India and SpiceJet. While this seems like a lot of capacity, Mumbai is a huge market for Etihad and Emirates and the two carriers are generally keen to add capacity into India. As is the case with Beijing, the opportunity to codeshare with SAA on Abu Dhabi-Mumbai could particularly be attractive to Etihad and Jet as the duo now have a rather limited four daily frequencies on the route. 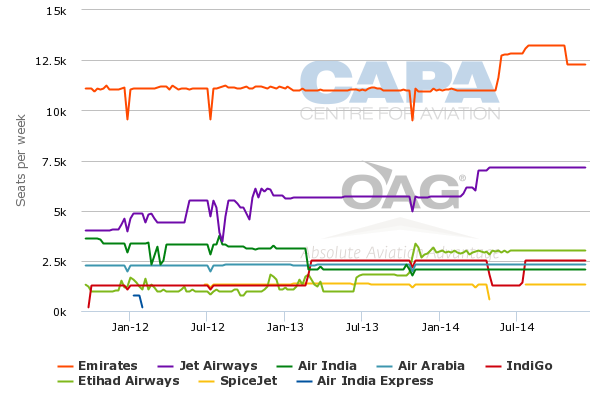 While the losses on Mumbai have not been nearly as stiff as Beijing, SAA has traditionally struggled on the route as South Africa-India is primarily a highly price sensitive ethnic and leisure market with relatively limited business demand. Jet Airways stopped serving Mumbai-Johannesburg in 2012 and began codesharing with SAA in early 2013, including on domestic connections beyond Mumbai. But losses have continued to mount as a large portion of passengers travelling between South Africa and India buy one-stop products via the Middle East, which are generally less expensive. Gulf carriers also have large Indian networks, allowing them to provide an array of city pairs to South Africa-India passengers along with higher frequencies than SAA. SAA currently operates daily A330-200 flights to Mumbai but according to OAG data will reduce the schedule to six weekly flights from mid-Jul-2014 and switch to the A340-300 from the end of Aug-2014. A stopover in Abu Dhabi or Dubai would instantly improve the viability of the route and potentially enable SAA to return to a daily service. An enhanced tie-up with Etihad and its "Equity Alliance partner" Jet Airways would also allow SAA potentially to offer over 20 Indian destinations via Abu Dhabi - subject of course to bilateral rights. Jet has been planning to use Abu Dhabi as a hub and significantly to bolster its Abu Dhabi-India operation to include 23 routes. SAA would not be the first Emirates or Etihad partner to add a stop in Abu Dhabi or Dubai in an attempt to improve the profitability of long-haul routes. Emirates partner Qantas now routes all its flights to London via Dubai. Air Seychelles and airberlin currently stop in Abu Dhabi on their services to Hong Kong and Phuket respectively. Air Seychelles is also launching service to Paris via Abu Dhabi on 2-Jul-2014. But Air Seychelles and airberlin are both much closer partners with Etihad than SAA, while Qantas is by far the biggest partner for Emirates. Etihad owns stakes in both Air Seychelles and airberlin. Etihad has an open mind to partnerships but may not respond too warmly to the idea of sharing one of its key routes (Johannesburg-Abu Dhabi) with a partner that is not part of its Equity Alliance. Another one of Etihad’s non-equity partners, Garuda, had an Abu Dhabi stop on its Jakarta-Amsterdam service but the route proved to be highly unprofitable and was recently dropped. SAA could potentially attract an investment from Etihad, making it more likely for the two carriers to forge a more comprehensive partnership. But the South African government has in the past been very restricitive when it comes to foreign ownership and control issues - although that posture has arguably been more intended to protect SAA from competition. Emirates does not have a model of investing in carriers and generally approaches partnerships relatively cautiously. 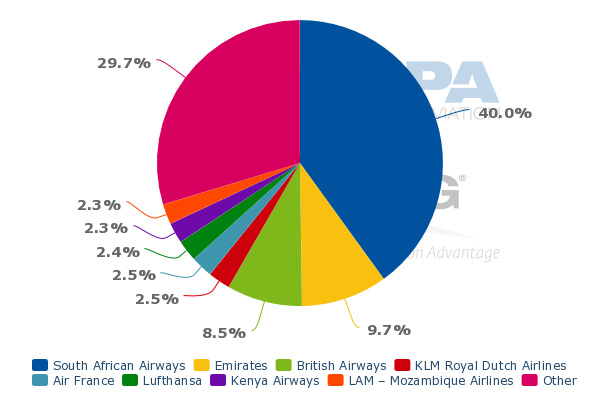 Emirates currently only has 12 codeshare partners most of which, including SAA, are limited. Emirates has said it is open to considering other partnerships along the model of its tie-up with Qantas, which was implemented in early 2013, and the carrier has received a number of approaches. But so far Emirates has not seen any potential partnership that provides the same kind of benefits as Qantas and would be worth pursuing. SAA probably does not fit the profile that Emirates would be looking for in that respect. Persuading Etihad or Emirates to agree to a bigger partnership and share a key route with a relatively small and ailing flag carrier may not be easy. Etihad and Emirates both value the South African market but may prefer to retain rather limited partnerships with SAA as stronger partnerships could risk cannibalising their own businesses. SAA also has a much higher cost structure, making any kind of metal neutral partnership potentially challenging. The airline also comes with a mass of legacy issues and an upredictable and constantly meddling government owner, adding to its list of partnership complexities. But pursuing Emirates and Etihad is a sensible strategy for SAA and there is certainly no harm in trying to cosy up to the Gulf giants. SAA offers something tangible – additional access to Beijing and Mumbai – and a strong presence in a strategically important market, South Africa. SAA can also play one against the other in a bid to up the ante. SAA continnues to be confronted by huge challenges as it tries to turn around its highly unprofitable long-haul operation. But if it can succeed at partnering Emirates or Etihad and adding a UAE stop to two of its Asian routes SAA’s outlook will get a much needed boost.